Here we are with another 8 reasons that you should be playing Train Simulator, and if you already are, maybe there will be some you haven’t thought of! Half way down, we are onto the final 32 reasons, and today we’re going to be talking about your fellow drivers and passengers; the community. 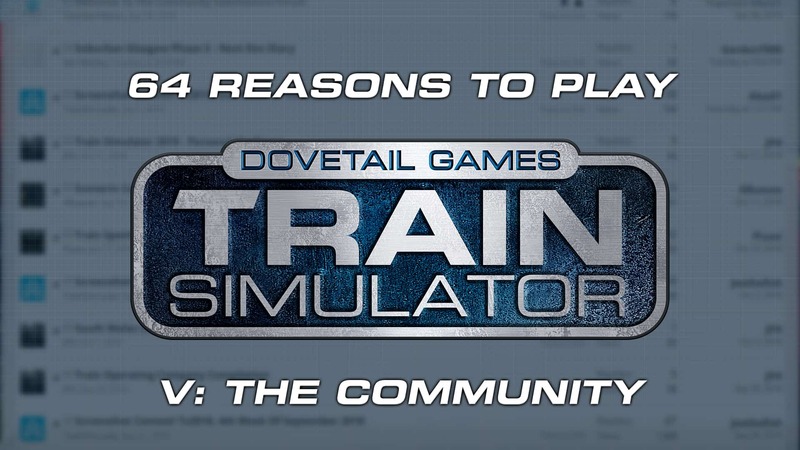 Thousands upon thousands of you play Train Simulator already, and the number only grows each and every day. Most of you will be avid train enthusiasts, others are discovering this phenomenon for the first time, and what’s great is you are not alone. Our forums are the best place to get to know each other, and us! There’s a lot to talk about when it comes to railways and their traction, the history, the successes, the failures, the world records and the lines we’d be lost without today. Of course, you can also delve into the virtual conversation, what routes offer certain experiences, what locomotives are a “must have”, and what scenarios are worth playing, especially now that 64-bit has arrived. Played a fantastic scenario? Why not tell people about it on the forums; and swap driver stories after each run. You could even collaborate with other drivers by setting up a virtual railway company. Of course, if you create your own scenarios using the editor, you can also upload them to the Steam Workshop to share directly, and give people the level of immersion that you created. If you’re new to train simulation, or trains in general, our Academy will get you started but there are plenty of ways to further enhance your knowledge, including learning from the community. Discuss railway terminology, take a look at community-made guides, work out techniques together and master you machines. If you’re ever at a loose end and can’t think of what to drive next, those who also play Train Simulator could give you the idea you’ve been waiting for. Talk about favourite journeys, or browse through screenshots to see what others get up to, you may just find the inspiration you need to hop into the next cab, and maybe you can inspire fellow drivers. The fun in entering competitions is taking part of course, however with our frequent screenshot competitions, the winning entry gets a slot in the Train Simulator loading screens, so every player has the chance to see it. You can submit your own entries, or vote on the forums for your favourite screenshot from another driver. The community is packed full of talent, and the Steam Workshop is testament to that. There are over 20’000 entries to explore; edited and from-scratch free roam, career, standard and railfan scenarios, fictional routes, route merges, route extensions, edited routes, remakes, easy journeys, challenging climbs, the list goes on, and more is added very day. Like our Facebook page, or follow us on Twitter, to see the latest news and discuss it among others, as well as ourselves of course, in the comments and replies. There’s always something going on, and you can get directly involved!